We “Follow The Fish” daily anchoring in the hot spots of the north and central coast regions of Prince Rupert, Langara Island and Bella Bella, British Columbia, during peak fishing for trophy BC salmon and halibut. This is a saltwater and stream fishing paradise featuring abundant wildlife and variety. 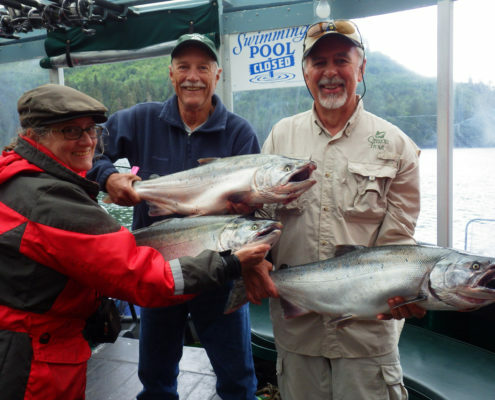 As we travel the Inside Passage, we cruise through some of the most exotic scenery in the world and enjoy the best salmon & halibut sport fishing. There is plenty of time for going ashore, join us for a beach BBQ, river explorations and crabbing or explore on your own with nature hikes, beachcombing and whale watching. This region of B.C. 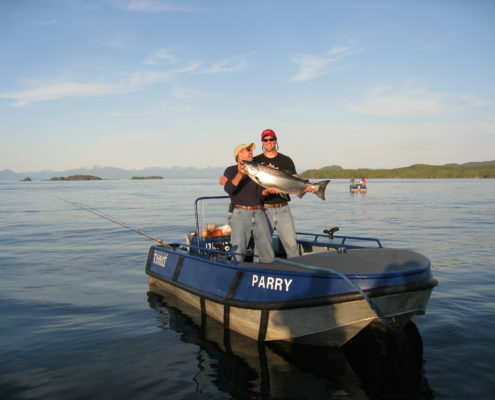 borders the Alaska panhandle and is home to the famous Skeena and Nass River runs of Chinook (King) salmon. These impressive salmon are world famous and reach weights upwards of 90 lbs. Experience close encounters with schools of porpoise, Orcas, Humpback and Grey whales as we move daily to stay on the fish. Keep an eye out for the elusive Spirit Bear as we travel the waters of the Great Bear Rainforest.